Despite having eaten only one banana in my entire life (I was nine when my life-long hate started), I do tend to get a bit gooey for banana bread. While my husband might keep the banana brokers in business, he often buys more than he can chew at once. The ones he doesn’t manage to stuff into his maw before they turn brown end up inour freezer where they shrivel, turn black and get baked into banana bread. Not a bad life-cycle, I think. One of the most repeated recipes in my kitchen is this wonderful cinnamon and chocolate banana bread but sometimes one needs to shake it up a little. This banana bread is a delicious one and it has a wonderful pedigree – it comes from the Baked cookbook which has given my kitchen so much wonderful baked bounty in the past. This recipe is no exception. The original recipe makes muffins but I decided to go with a loaf pan instead. Also, the recipe easily doubles and freezes well in case you want to get all your baking done at once. Chocolate and espresso? Oh yeah! 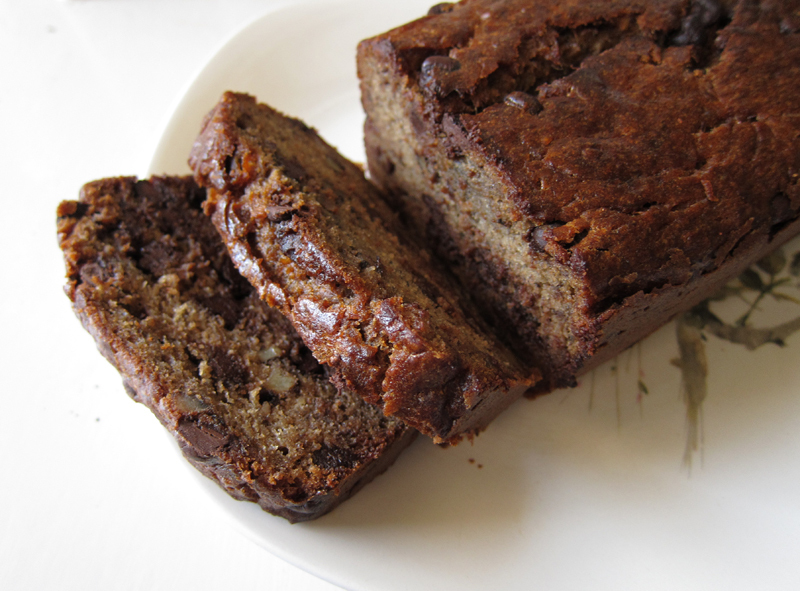 This is a great banana bread to wake up to in the morning as it pairs so nicely with a good hot coffee. If you are a walnut-hater (and a surprising amount of you are), then just replace the walnuts with more chocolate chips and you can’t go wrong. Preheat oven to 350F. Butter and flour one loaf tin and set aside. In a large bowl, mix together the bananas, sugars, butter, milk and egg. In another bowl, combine the flour, espresso powder, baking soda and salt. Pour the wet ingredients into the dry and stir until just combined. Fold in the chocolate chips & walnuts. Pour into prepared loaf pan and bake for about 55 minutes, or until the top is golden and a toothpick inserted in the middle comes out clean. Let cool in a pan for 15 minutes and then invert onto a wire rack to cool completely. The bananas in my freezer are so destined for this loaf. I’ve made one too many plain banana breads – even the blueberry ones are losing their lustre. Thanks for this! I can never seem to have enough leftover ripe bananas to make delicious things like this! Not gonna lie, I’m totally not a banana fan as well but we ALWAYS have bananas that are about to go bad around here…and I am always trying to find new banana bread recipes! Love that this has both espresso AND chocolate. Can’t go wrong there. This one might actually have to happen sometime soon. I’m always looking for banana breads that are a bit more exciting than the typical one. This sounds perfect! Bananas and espresso and chocolate? Hell yes! This looks great! I am definitely a walnut hater, they make my mouth break out in sores! But I have found that pecans make an excellent substitute for walnuts in almost any recipe. Do you think there’s a way to do this using actual espresso instead of the powder without messing up the wet/dry ratio? Thanks! Julie, give this one a try – it’s far from boring and plain! Michelle, buy more and let a few get spots & then immediately put them in the freezer. So great to meet another banana hater, Joanne! Enjoy, it’s a good one. Meister, seems like this is made for you. It’s super easy to mix up, so it’s perfect for non-bakers! I love your enthusiasm, Renee! Jennifer, thanks for the tip! I love pecans too. Leyna, you might want to replace the milk with double-strength espresso. Give that a try! I love banana bread, but my bananas never last long enough to get spotty and perfect for making into bread. My 3 year old eats at least one a day, so a bunch never lasts very long. Nom! I have a soft spot for banana bread. I love it with toasted walnuts inside, they go so well with the chocolate! This looks great. I like the combination of flavors. I’m always trying new things with banana bread. This is a keeper. The baking soda amount seems to be missing from the recipe. I made the Willie Nelson version instead…no butter or fat in that one, but it’s in the oven and looks and smells great so far. At first I was like, what? Only one banana in your life ever? And then I realized that I might have the same issue: I cannot hang with the texture! But I love them in baked goods and I cannot even begin to express how intensely I’d like a slice of that right now. Tracy, love all that baking! Maybe it means fall is coming soon! 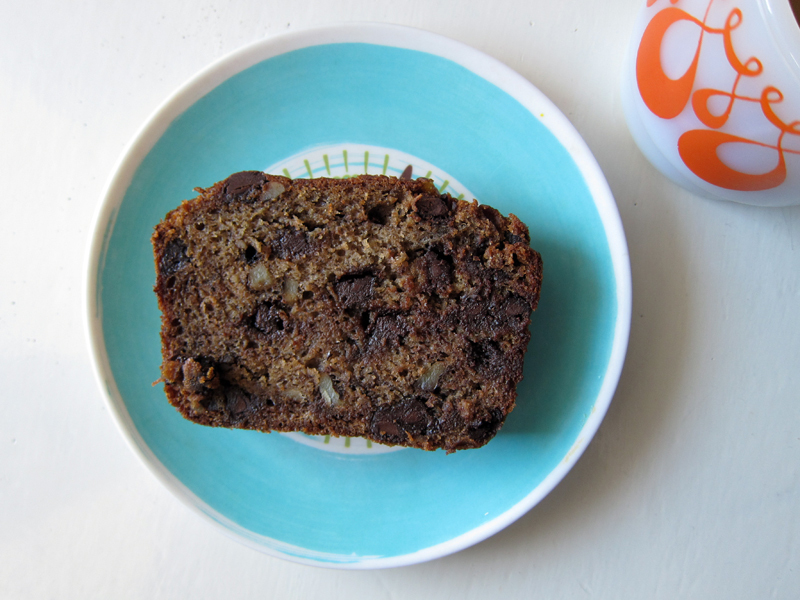 Gretchen, maybe put some aside – this banana bread is really worth it. Thanks for the shout out, Redpath! Jacqui, well then I think you’ll love this bread. It’s a keeper for sure. I hope you give this one a go, Barefeet, I’m sure you’ll love this flavour combo. Doh Rema!! Thanks for noticing – I’ve corrected the error. Sorry about that – shouldn’t type out a recipe so late at night next time. My bad. Rachel, the pans I have are handmade hand-me-downs from my husband grandmother, but I just grabbed a ruler and it’s about 8×4″. Eloise, sorry about that, it’s been corrected, but I’m glad you made the Willie Nelson version – it’s such a great one! Enjoy. Oooh! This sounds perfect for breakfast with a cup of coffee! Are there really walnut haters out there?! That is just unheard of in my house. I have a similar overabundance of bananas on a regular basis, so I’m always looking for something to do with them before they end up in the garbage! Mushy bananas are not my thing, so this looks like an awesome alternative. Christine, it seems like it’s true! Not here, that’s for sure. Glad I could help you out of your mushy banana glut! But throw them in the freezer, never the garbage!! I think you’ll like this one too, Bijoux! i seriously hate bananas, but i also hate myself for hating them! Bananas and chocolate AND coffee? How do you read my mind, woman? Espresso is such a great addition. I’ll be letting some bananas go just so I can make this ASAP. Thanks so much for the help with the pan size! I’m making this right now and can I just say, it smells SO good in here! Alana, glad I’m not the only one who has a banana hate-on! Thanks Kathryn, it’s a worthy combination. Hooray, glad to hear it Rachel! I made this recipe today and let me tell you, it’s about the best banana bread I’ve ever had and/or made. I love this recipe!! It’ll work for comfort food, dessert, breakfast, snack and it’s soooo good. Thanks for posting this one! Whaaaaa?! This has two of my favorite things ever: bananas and coffee. Must. Make. Soon. Adrianna, I hope you do – it’s a delicious version!! I made these as muffins, but they just came out kind of blah. I thought I had a loaf pan but I don’t so I should remedy that situation. Also have you thought of Blackberry Banana Bread? It’s pretty awesome. Joshua, too bad you didn’t like these! I really loved it. I’ve never tried a blackberry bbread, so maybe that will be next on my list! 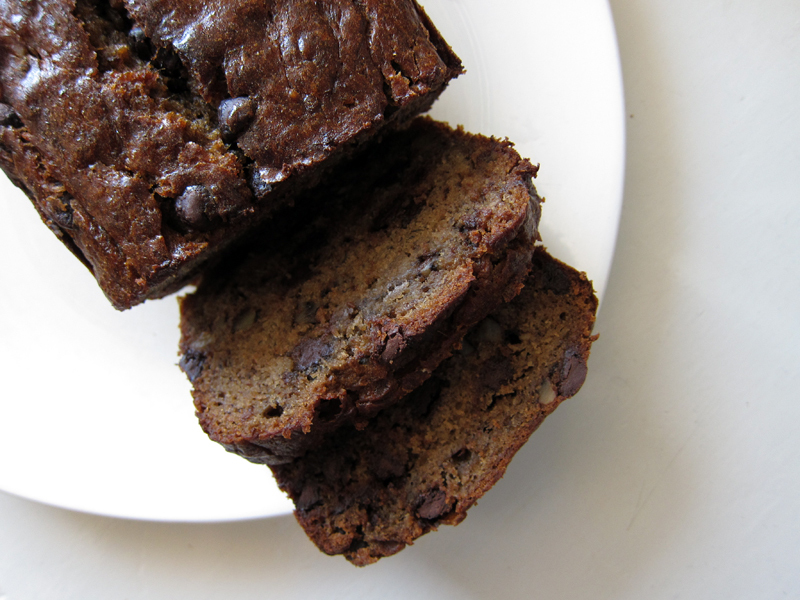 In searching for banana chocolate chip bread recipes, I bookmarked a few before finding yours. Seeing espresso made it an immediate winner. I just tasted a bit of batter, and my reaction was that it tastes like buttery heaven! I’m taking the bread to a bbq later, so I can’t wait to see what people think of my first ever attempt at banana bread. Becky, I hope you love it and that it goes over well at the bbq! Enjoy! I’m the opposite of you. I love bananas but don’t really like banana bread. Though it’s been a while since I made it and I’m not feeling the urge. I need to get some chocolate chips though! This one looks delicious. Needed a recipe for the 4 bananas that had been sitting in my fridge for a week looking pretty sad and brown. I just couldn’t get myself to throw them out. Never made banana bread before and this recipe sounded yummy. And so it is! Made the bread yesterday and eating a piece as I am writing 🙂 Thanks! Forgot to mention that I didn’t use the instant espresso powder since I do not like coffee. Instead I use the same amount of cocoa powder which goes perfect with the rest of the flavors. Ashley it is delicious and I think you should make it again – might change your mind? Esther, glad you love the bread and I love your substitution. Great to hear! I made this, and took it to poker night, it was a big hit with my buddies. I won the game this evening, so some portion of that $120 has to be credited to the power of the Pleat. When you publish the book, be sure to put walnuts into the baking instructions. Nice win, Robert! Glad the banana bread was a hit too & thanks again for your watchful eagle eyes here. Added the walnut step. Thank you, again. Gonna make this tonight, Im in Ireland so I had to convert to grams. What does the t stand for Tablespoon or Teaspoon? Michael, t = teaspoon, T = tablespoon. It’s a common short form. Enjoy! Need. Want. Must BAKE this ! Anni, yes! I used instant espresso powder so I’m sure instant coffee powder will work just as well. Enjoy this is a great recipe! Janny, so glad to hear it!! This has turned into my favourite banana bread recipe. How do I know that? I was willing to turn the oven on during our BC heat wave! Otherwise it has been salads & BBQ time!